Saturday 15th March was a hugely important day in the history of Fifth Sense, as we launched ourselves as a charity with an event that looked at the ways in which the senses of smell and taste play a huge role in our lives, and also highlighted the problems faced by people who suffer impairment of one or both of these senses. The day consisted of an afternoon press launch featuring talks from some of the academics, scientists and researchers with whom Fifth Sense is working, personal experiences from Fifth Sense members, with Fifth Sense Founder Duncan Boak talking about how his own experience of losing his sense of smell following a head injury led to him establishing the organisation. 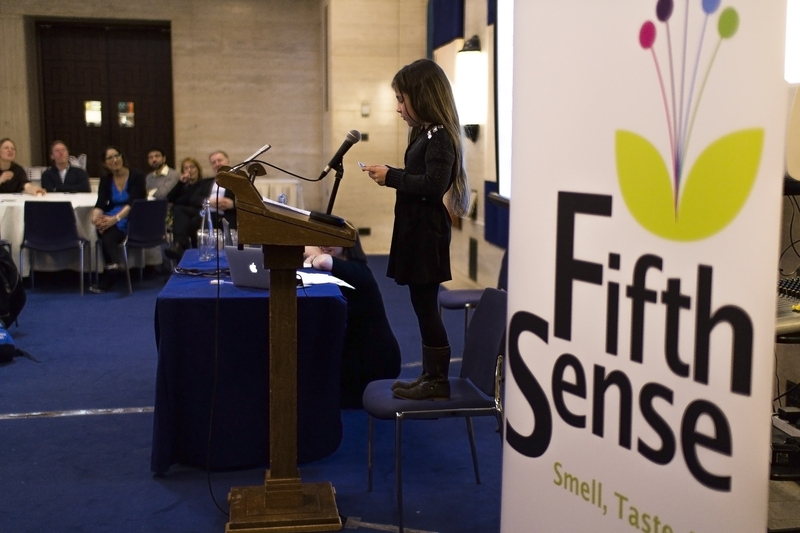 The press launch was followed by an evening drinks reception organised especially for Fifth Sense members to come and celebrate what we intend to be a much brighter future for smell and taste disorder sufferers everywhere. 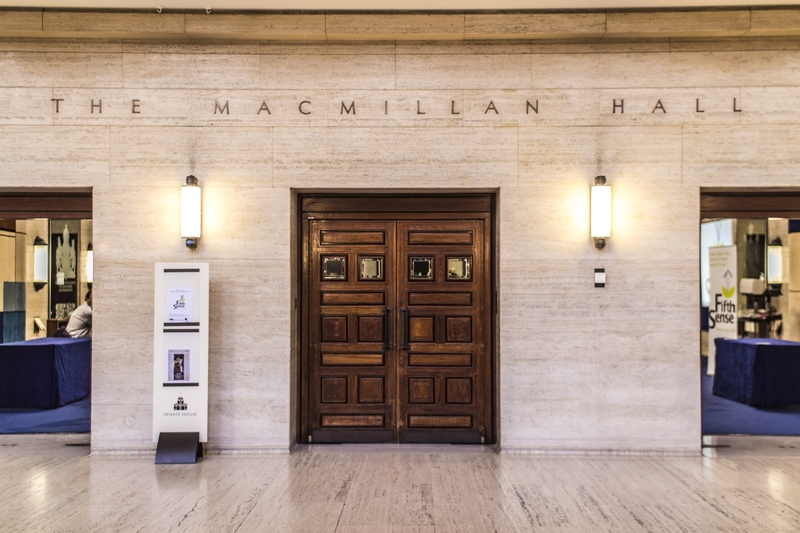 The launch event was held in the Macmillan Hall, Senate House, London, and was delivered in partnership with the Institute of Philosophy at the School of Advanced Study, who are leading the AHRC Science in Culture project ‘Rethinking the Senses’, in which Fifth Sense is a partner. Structured as a ‘past, present and future’ of the sense of smell, the event opened with a fascinating talk from Urban Sociologist Alex Rhys-Taylor of Goldsmiths College on the importance of the sense of smell to western civilisation throughout history, focusing on London. Starting with the Romans, who sited their sewage treatment in East London, away from their homes, Alex explained how the sense of smell directly influenced culture and society through the ages. He also explained that it was during the Age of Enlightenment in the late 17th and 18th centuries that the sense of smell started to be perceived as being of lesser importance than the senses of sight and hearing; smell began to be viewed as a primitive, animal, sense, of no relevance to the advances that were being in understanding the world through science. Alex was followed by Fifth Sense Founder Duncan Boak, who spoke about the different ways in which the sense of smell affects our lives, and the different types of smell and taste disorders. He also spoke about the many different ways in which such conditions impact on the lives of sufferers, using anonymous comments from Fifth Sense members who have completed the ongoing Quality of Life of Smell Disorders survey. Duncan’s slides can be viewed by clicking here. Duncan then introduced Fifth Sense member Charlotte Self, who spoke candidly about how her loss of smell had a profound impact on her life, and how it directly contributed to the breakdown of her marriage. Charlotte’s powerful and deeply moving testimony clearly demonstrated just how disorders of the sense of smell can have far-reaching consequences for sufferers. Dawn Millard and her nine-year old daughter Abi then spoke. Dawn started by explaining how she had realised that Abi had no sense of smell after noticing how she never made reference to smells that her friends would remark upon, and then spoke about how doctors she had seen lacked knowledge and failed to even see it as being a significant problem. Abi then delivered a superb presentation on the sense of smell and how important it is to our lives, the same talk she had given to her classmates at school. 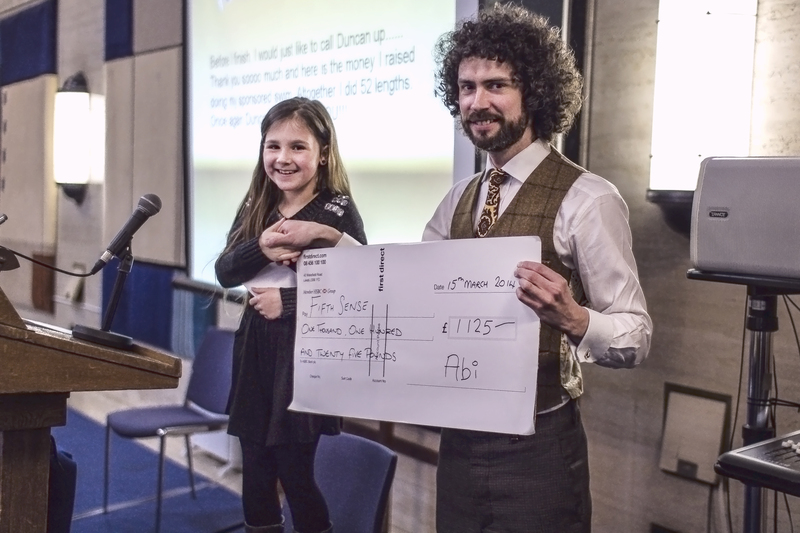 Abi also talked about the sponsored swim she did recently where she raised an amazing £1125, and presented the cheque to Duncan. 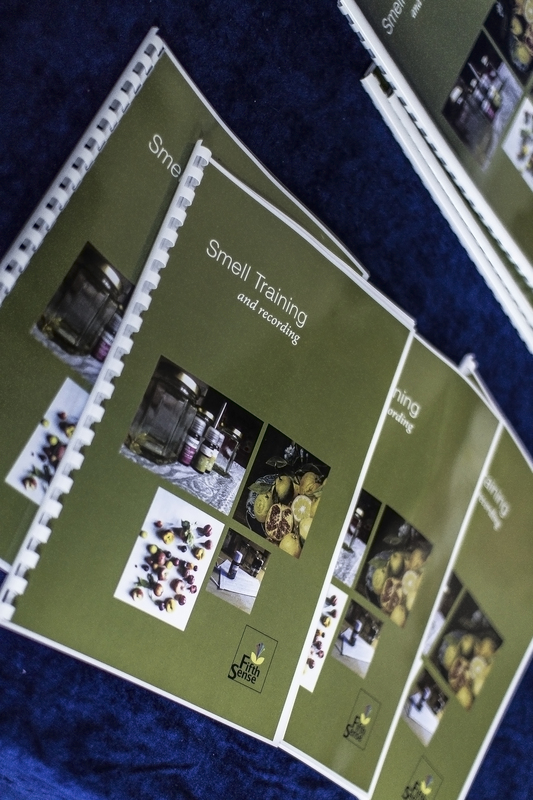 The work that Abi has done to raise awareness of anosmia and the importance of the sense of smell has been incredible, and we are going to have a special blog post about her story very soon. After a break, Mr Carl Philpott, Consultant ENT Surgeon at the University of East Anglia / James Paget Hospital spoke about the different causes of smell and taste disorders and what can be currently done to treat them. He also talked about the challenges faced in undertaking research to develop new treatments, the main problem being the lack of awareness and recognition for such conditions amongst the medical profession and funding bodies. The slides from Mr Philpott’s talk can be viewed here. Duncan then spoke again about how Fifth Sense intends to develop its work over the next three years, stressing the importance of continuing to develop Fifth Sense as a strong, supportive community for smell and taste disorder sufferers, and how this community will underpin the three key areas of Fifth Sense’s strategy; support, education and research. Mr Philpott then joined Duncan to talk about the planned Fifth Sense National Smell and Taste Survey, which will gather data on the prevalence of smell and taste-related disorders in the UK and provide a huge boost to our efforts to improve treatment opportunities and research in future. Fifth Sense member Chrissi Kelly then spoke about the ongoing Fifth Sense smell training project that she is playing a leading role in, and how her own successful experience of following this process has informed the creation of the Fifth Sense Smell Training Journal, which will be available for Fifth Sense members to test out very soon. Leading researchers Simon Gane and Darren Logan then did a joint presentation that covered the work they are doing into improving our understanding of how the olfactory system functions, and how this can lead to better understanding and therefore treatment of smell and taste-related disorders in future. Duncan Boak and Professor Barry Smith of the Institute of Philosophy then talked food; Barry explaining the role of the sense of smell in flavour perception and what taste really is, with Duncan talking about his own passion for food and cooking and how he makes the most of the other senses available to him when creating meals. 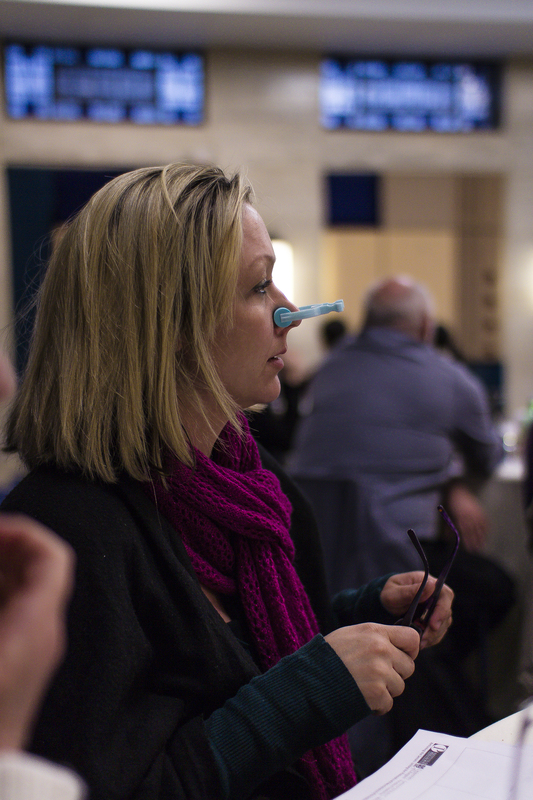 Wine journalist Maggie Rosen then led the wine tasting session, which had two purposes – to demonstrate the impact that smell loss has on flavour perception to the journalists present (who were issued with a nose clip to ensure a level playing field!) and also show that smell loss doesn’t remove the ability to detect differences in wines. We’ll be putting another post on the blog to cover this in more detail very soon. 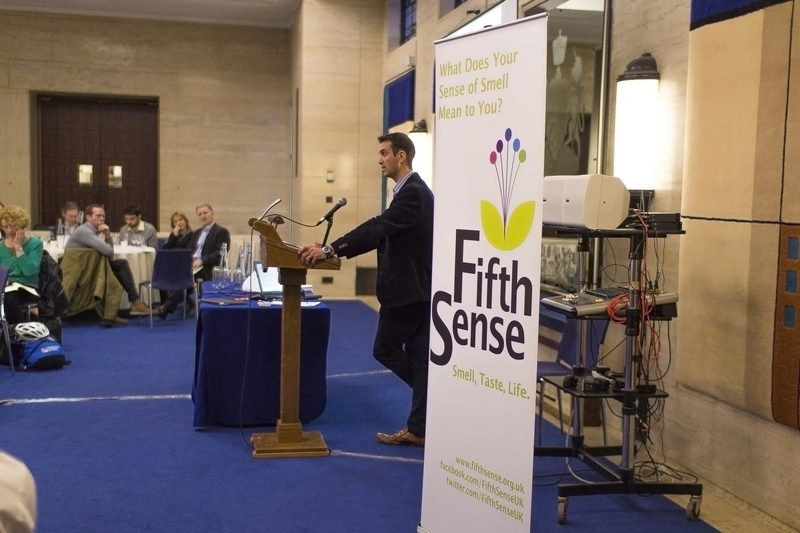 Following the conclusion of the wine tasting, we then welcomed Fifth Sense members for the drinks reception, at which Duncan and Mr Philpott both spoke about the success that Fifth Sense has achieved in the relatively short period of time since its inception in mid-2012, and about future plans. 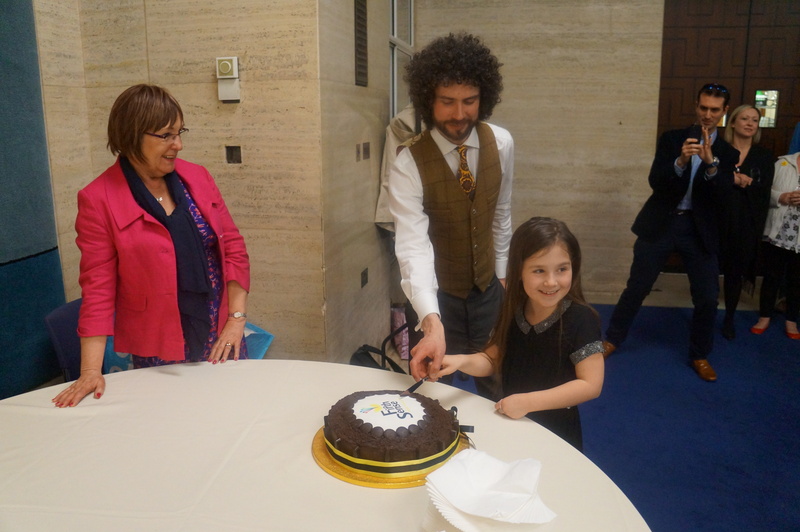 Duncan and Abi then cut the beautiful cake made by Fifth Sense Member June Blythe especially for the occasion. All in all, it was a hugely successful and special day – onwards and upwards! 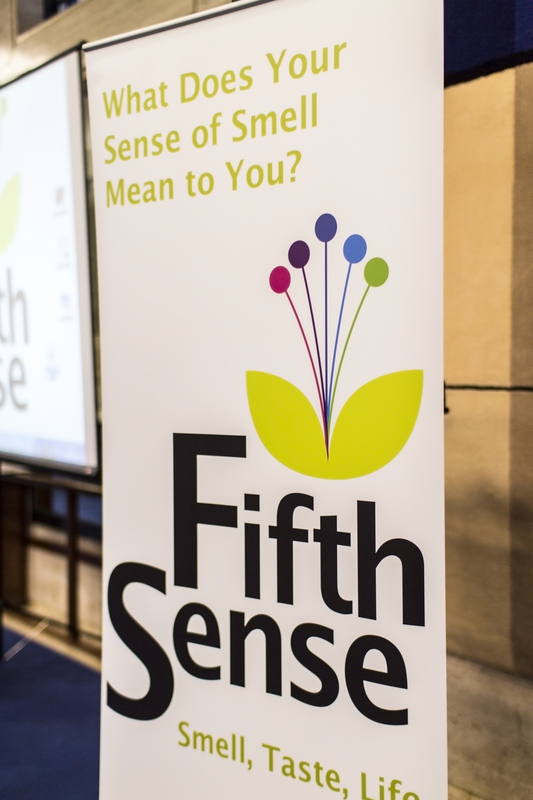 We would like to say a huge thanks to all our speakers and our guests at the press launch, and the many Fifth Sense members who came to celebrate with us at the evening drinks reception. 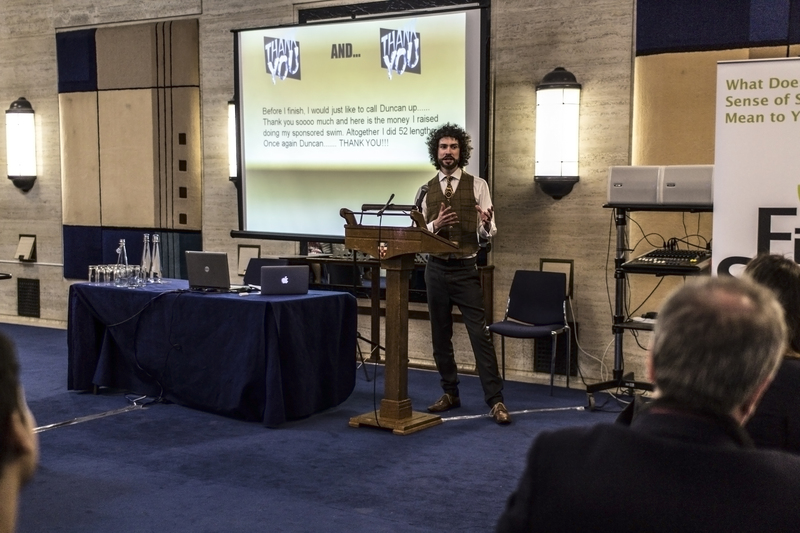 Special thanks goes to the following people for their support and assistance in the organisation and delivery of the event: Natasha Awais-Dean, Prof Barry Smith and all at the Institute of Philosophy, Maggie Rosen, Abraham Drewry, Nayan Gowda, Keeley Sellers and Sally Turberville-Smith. And of course, a huge thanks to June Blythe for baking the amazing Fifth Sense cake – what a wonderful surprise! This entry was posted in Uncategorized and tagged anosmia, charity, fifth sense, sense of smell, smell and taste, smell loss on March 27, 2014 by Fifth Sense. I really look forward to hearing more about what Abi Millard had to say in her presentation. I have lived for 55 years with absolutely no sense of smell whatsoever and nobody has ever given me the slightest suggestion as to what the congenital problem might be. I don’t suffer from withdrawal symptoms because I have never lost something I once had. But I am aware that around me are people and other animals including the bees which I keep who have the ability to recognise billions of chemical combinations with their noses. Maybe I am a tiny bit jealous but more than that I am curious to understand more about it all. I hope that there will be a chance to learn through Fifth Sense a bit more about what people like Abi and me are missing. Thank goodness I have found some help! My son, now 11 years old was born with no sense of smell. We live in Norwich, and when we realised he couldn’t smell (age 4), we got referred to the hospital for tests including an MRI scan, followed by yearly checks to see if he was developing as he should. At about age 8, he was discharged, with no help or advice offered. He doesn’t like to talk about his anosmia much and hides it from his friends. As his mum, it upsets me a lot and I even find myself trying not to talk about or comment on smells (which i know i shouldn’t), which is hard, especially when he’s got two younger sister’s who can smell. He does ask me why he doesn’t know anyone else who can’t smell & I guess it makes him feel quite alone. As I was looking up anosmia again on the internet tonight, I came across Five Sense & the links with the James Paget in Yarmouth which is 15 minutes from our house! I just wondered if there is any events for children with anosmia?